Merry Christmas from Stripper's Guide! Allen, we wish you and Judy a Very Merry Christmas and all the best for the New Year. What year would that be from? 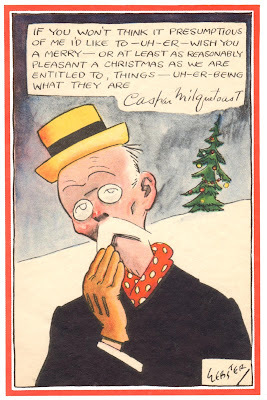 There was no copyright on the original card; I'm guessing early 30s from the sentiment. Jim Ivey wishes his Stripper's Guide readers and friends a merry Christmas with this Santa who is a little more than he seems. 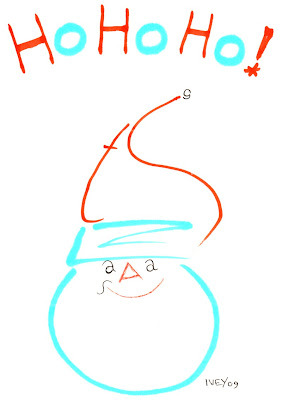 Merry Christmas to you and Jim. Rob Smith, John Beatty and I had hoped to get over and see Jim earlier this month, but things just kept popping up. I hope to see him soon. As always, thanks for posting Jim's toons and to Jim for making 'em. No mere samples for you comics lovers today, here we have the entire run of Wrangle Flats -- all two of 'em. This is the very first titled series by the great but often-maligned T.E. Powers. It appeared in the New York World (and in the St. Louis Post-Dispatch as seen here) on October 14 and 21 1900. 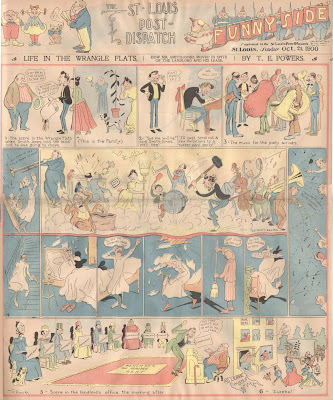 Powers was already an old hand at cartooning -- his work appeared in the pioneering Chicago Inter-Ocean way back in 1893. Powers did some beautiful design work on these two pages, as usual he was ahead of his time. The middle section of the top strip, with panels combining into a cross-section of the apartment building, is particularly impressive. 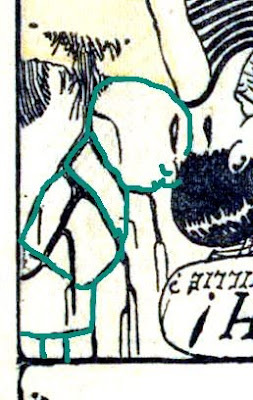 One didn't often see such avant-garde graphic flourishes on the comics pages of the day. The humor is also a cut above the norm, cosmopolitan and satirical when the typical fare was bratty kids, hayseed farmers and mush-mouthed racist stereotypes. Powers wrote for adults -- let the knee-biters look elsewhere for their weekly dose of slapstick. Much thanks to Cole Johnson, scanner of today's obscurities. Why was Powers "often-maligned"? I'm not terribly familiar with his work, but it's obviously several notches above what some other cartoonists were doing back in the day. Perhaps "Maligned" in the sense that he was often disregarded, as his simplistic style got sloppier as time went on. Soon after this he went to work for Hearst, often doing the editorial on the back page of the evening papers in the chain. By the 30's these are pretty slapdash and often confusing in the point he tries to make. Incidentally, the moving sidewalk at the Paris exposition that year was among the marvels that really caught the world's imagination, and probably inspired the cartoon above. Some folks, obviously myopic, have been calling Powers the world's worst cartoonist for many years. One of them is the usually more perceptive Tom Heintjes, who takes pretty regular jabs at him in Hogan's Alley. Thanks Allan, and Grizedo. I've got some issues of "Hogan's Alley," but I guess I haven't noticed (or just don't remember) the shots at Powers. Great mag, though. Obscurity of the Day: Oh, Where, Oh, Where, Has That Willie Boy Gone? Walter Wellman is one of the banes of my research. His output was phenomenal in the 1900s-1910s, but it was mostly little arrays of gag cartoons that were often chopped up into pieces by his client newspapers. Although the complete versions of his features were undeniably series, they're all but impossible to track. If that weren't enough, he also shared his name with a famous reporter/explorer of the day. Every time I stumble upon the name in an old book on journalism my heart leaps to think I'll learn something about him, but it invariably turns out to be the other Walter Wellman under discussion. As best I can tell the cartoonist Walter Wellman was based out of Boston, but he jumped around enough that is impossible to tell from which syndicate many of his daily-style series were published. I'm half-convinced that he was an early self-syndicator. Today, though, we have a Wellman series that poses no mysteries other than the one asked in the title of the feature. Oh, Where, Oh, Where, Has That Willie Boy Gone? 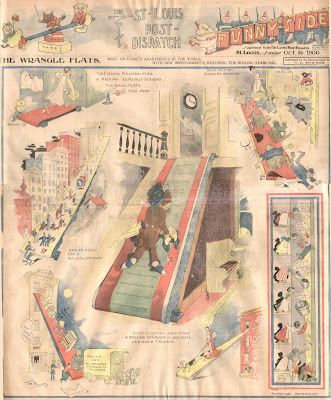 ran in the Boston Herald Sunday comic section from May 6 to October 14 1906. It's basic premise is one shared by a kazillion other features -- the pranks of a mischievous boy. 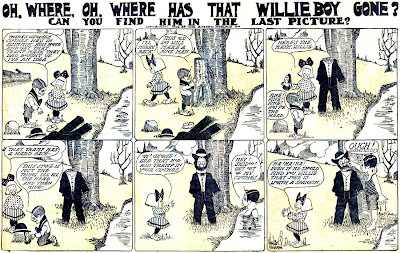 Wellman, though, adds an extra wrinkle by having Willie 'hide' in the final panel of each strip. Can you find Willie in our two samples today? They are a bit of a challenge, but he is there. Tip of the hat to Cole Johnson, contributor of today's samples. Thanks Cole! I had not heard of Wellman, or of this particular strip, until now. Thanks mucho. Your blog is truly a treasure trove of information and enjoyment. I give up. Where is he in those last panels? At least a hint? They are toughies. A Hint -- disregard the lower 1/2 of the panels entirely -- in both he's hiding in the upper half. Let me know if you still have no luck. 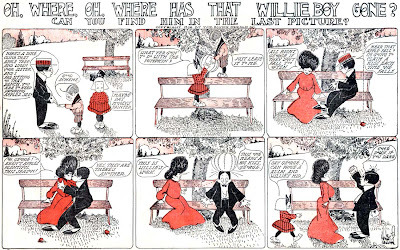 In the first strip, it seems that Willie may be represented as a disembodied head immediately to the right of George's neck. I don't know about the second strip. almost a month behind in my blog reading, and hopefuly no one else has discovered this for you... but he's in the 1910 census in Manhattan. 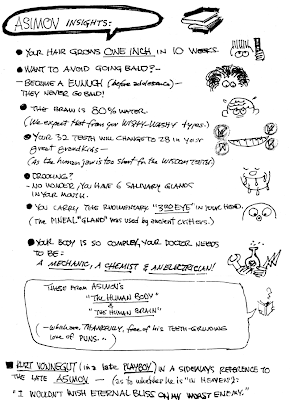 listed as "cartoonist"
Graphic Shorthand: Jim Ivey teaches the fundamentals of cartooning in his own inimitable style. 128 pages, coil-bound. Lulu $19.95 plus shipping, direct $25 postpaid. Cartoons I Liked,Jim Ivey's career retrospective; he picks his own favorite cartoons from a 40-year editorial cartooning career. Lulu $11.95, direct $20 postpaid. When ordered direct, either book will include an original Ivey sketch. Good day Jin, This is your friend Phil from Cumberand Farms, I truly Miss you and Silent Ron ha ha. I had a great Time hangin out with you guys In the Mornings, Thanks for all the Coffees. I am doing well now and Back home, Kinda cold up here.